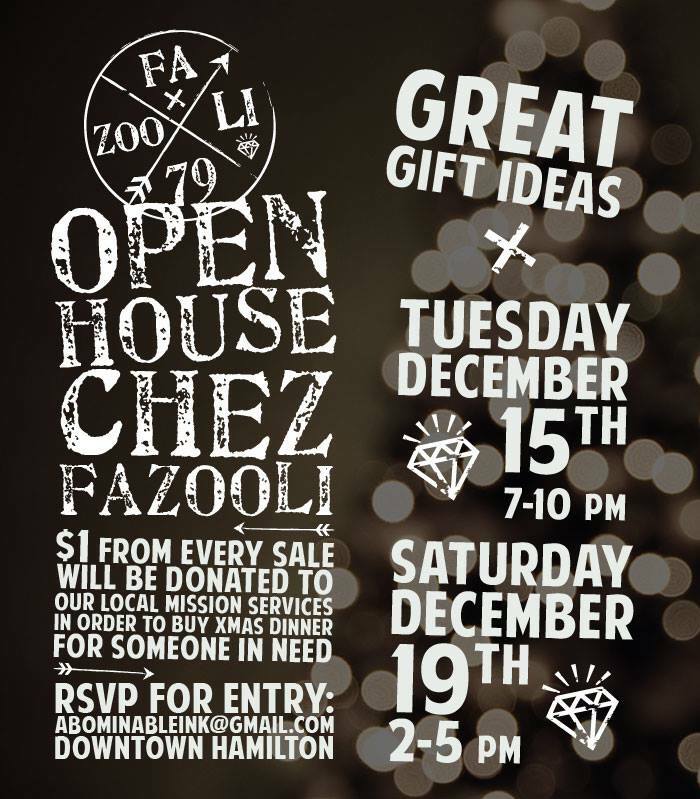 Last Open House @ Fazooli Studios Before Christmas! I’m having one more last-minute shopping opportunity tomorrow night from 6-9pm at my studio! Here’s your chance to drop in and grab that extra something before the big day! Message me for details! New Xmas Ad & New Facebook Page! Limited Edition Fazooli Ornaments Now Available! Fazooli ornaments are still available in limited quantities! Choose from the “hood ornaments” (sneakers, spraycans & lucky sevens) for $15, feathers & lucky sevens (in all black or black, white & red) for $10, or corkscrews in little glass bottles for only $5! Available now at Compilation (22 Wilson Street, Hamilton, ON – next door to Dr Disc), or directly though me by emailing abominableink@gmail.com. $1 from every item purchased through me will go towards feeding someone in need a Christmas dinner this year. Check out my Etsy shop (AbominableInkShop) for more great gift ideas! I’m super stoked! Tonight I’ll be spending Art Crawl at Compilation with Ankixa Risk, with her amazing Christmassy taxidermy art installation. We’ll have lots of really awesome gift ideas in store, so stop in and have a drink with us and check it out!